2. I'll fix any photo defects, like too dark, faded color, etc. 4. 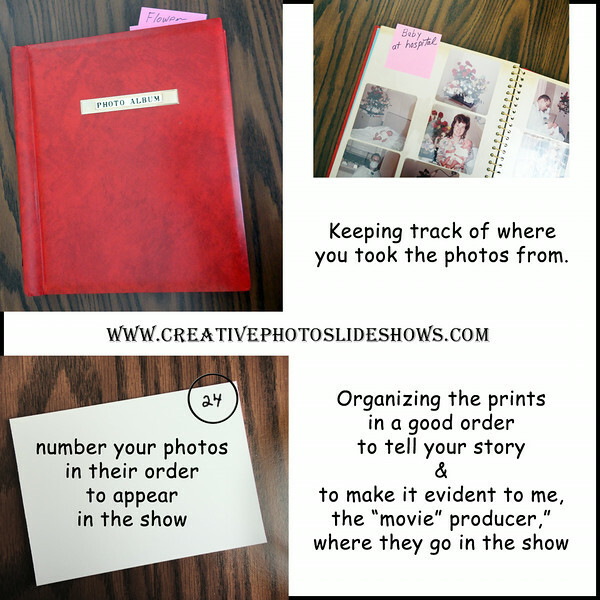 Have your digital photos printed as 4x6 prints if that makes it easier for you to organize your show in a stack of numbered prints. 5. Or if you're computer savvy, you can add the placement number to the beginning of each digital photo's title. Or you can write a list on a piece of paper or email me a description of where they go in the show. 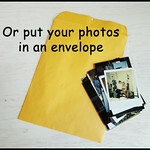 Then email the photos to carole@creativephotoslideshows.com. Keep in mind that photos with more than 2 people need to be displayed longer. So if you have photos of groups of people, like family or friends, count them as more than 1 photo. Average song is 3 minutes. So, a 10 minute show requires 3 songs, usually. I can edit music to fit. I can edit music as needed or according to your instructions. and a silent show doesn't carry the huge impact of a show with music. You'll understand what I mean when you watch this show again on your 1st or 5th anniversary! 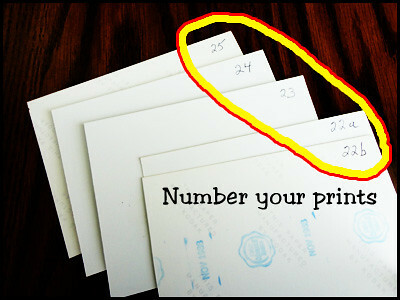 Don't put prints in the mail, because of the risk of loss. I will scan the photos if you can bring them to me in person. - I can scan photos while they're still in a magnetic album. - I can scan photos from yearbooks, magazines, newspapers, etc. Hold your camera (or phone) steady by not holding it in the air but by holding it securely on top of something like a table, a box, etc. No flash. Turn off the flash so that the flash doesn't go off. You can use a smartphone camera or a scanning app. I'll put them in order of "date taken" if you don't tell me otherwise. 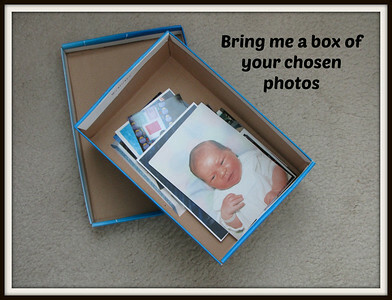 You can email me a description of how you want the photos organized. You can email the photos by attaching them to a series of emails or by placing them in a folder in the "cloud" and sending me that link (Dropbox, etc.). If you use photos found online, such as your photographer's website or Facebook, make sure they are NOT the little thumbnail size but at least as large as a computer monitor's screen. 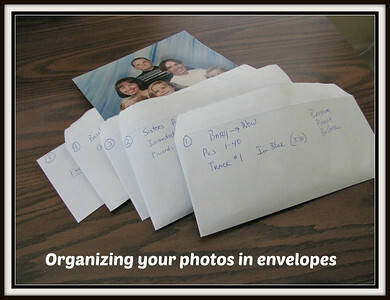 - Realize there's no easy way of letting us know your desired order for digital photos unless they are numbered to fit in with your scanned photo prints. - Know that original photos from your camera or phone contain the date taken, with which I can organize your photos chronologically. - Know that photos you download from Facebook, etc. no longer contain their original title or date taken information, so you'll have to tell us where to put them in your show. Video clips taken with your smartphone or camera can be used in your show. Keep them short, less than 15 seconds. I can edit a longer clip to the desired portion. Ideas are: you two talking to each other, one of you talking to the other one, your parents giving you their best wishes, etc. After I receive all photos and video clips, I'll create the show and email you the link to review it online for your approval or for revisions. If you ask for any revisions, I repeat the process until the show is approved. I'll email a preview of the DVD case and surface of the DVD disc for your approval or revisions. One day after your approval, your order will be ready to pick up.